‘The Yellow Canary’ (1943) stars Anna Neagle and Richard Greene, with show-stealing support from Margaret Rutherford. Neagle plays the upper class socialite Sally Maitland, and the action is set in 1940. At the beginning of the film we see her being shunned, insulted and berated over her pro-Nazi sympathies. We learn that she has spent time in Berlin with the upper echelons of the Nazi party and that she makes no secret of her admiration for them. Through this early plot line I was immediately reminded of those controversial 1930s socialites the Mitford sisters. These women continue to hold a fascination for us even today and I have to admit that I am among those who devour their diaries, letters and memoirs. This is not, I hasten to add, out of any sense of admiration. I think I speak for a lot of Mitford-ites when I say that their appeal is like that of a diamond-encrusted car crash. To anyone with an interest in inter-war society and politics they are unavoidable. Diana, Unity and Jessica – the politically active half of the set – represent the extremes of everything about that time. And to add to the spice they were all three of them as mad as a fruitcake inside a box of frogs. I was first made aware of the Mitfords when I studied 1930s British history. As part of my coursework I was sent off to examine why British politics did not succumb to extremism, unlike other European countries during those restless years. From Oswald Moseley and his Fascist Blackshirts it is an easy step to take to Diana (Moseley’s lover, then wife) and Unity Mitford and their pro-Hitler antics. I concluded that one relevant factor in the British retention of democracy is simply the national personality and our collective sense of humour. Our determination to prick the bubbles of pomposity is a national sport. Moseley and his Blackshirts were deliciously sent up by P.G. Wodehouse with his Roderick Spode character. 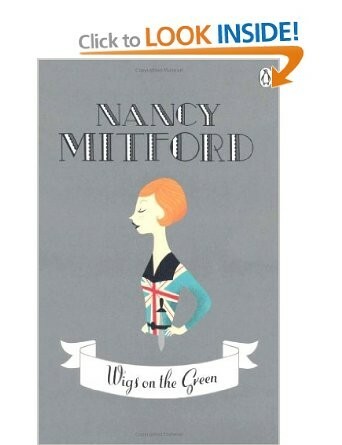 Even his sister-in-law Nancy Mitford (the marginally sane one) wrote a satirical novel starring Captain Jack and the Union Jackshirts called “Wigs on the Green” (1935). Nancy was so patently having a pop at Diana’s beloved that it opened up a long standing rift between the sisters. If this is what was happening in the higher echelons, I find it very easy to imagine that variety theatres in Blackshirt stamping grounds would have had a few turns who poked fun at the local lads who liked to play at dressing up and go mincing about the streets. There is also a Mass Observation report of a Blackshirt meeting in the East End being broken up by a group of people doing the Lambeth Walk through the middle of it. Where some countries stood in thrall to enigmatic extremists, we found that whole speeching/marching thing slightly embarrassing and giggled at it. To return to ‘The Yellow Canary’, the storyline of this film gave me a new dimension to the story of Britain and of the fascist Mitfords. 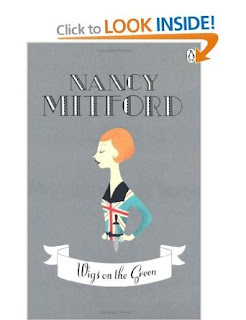 That Sally Maitland is meant to represent a Mitford is obvious. But the outcome of her story is vastly different to that of Diana and Unity. Sally turns out to be on our side after all, and has merely cultivated a pro-Nazi cover for her spying activities. At the end of the film she saves half of Canada from being blown up and is publicly exonerated. Neither Diana nor Unity ever renounced Fascism or Hitler, the former spending the war in Holloway Prison; the latter attempting suicide on the outbreak of hostilities and never recovering from her gunshot wound. This demonstrates how war temporarily changed our national personality in a way that we tend to forget, or gloss over. During the 1930s, people followed the Mitfords’ antics with a raised eyebrow, they took up space in the gossip columns, causing minor sensations. In wartime, this amusement was replaced by fear. No matter how we are portrayed as smiling through the worst of it, fear permeated society. The possibility that people at the top, those with connections and power, were against democracy was too much to countenance. All we had was hope. Hope that there was some good in these people somewhere, and that there might be a reasonable explanation behind their behaviour. Over time we have been fed images of Churchill, of the Battle of Britain and of blitzed cities battling on. We have been fed a belief that the British bloody-minded attitude, a refusal to give in is what got us through. Amid all the glorification, which grows with each passing year, we must remember that war means fear, it means subjugation of other facets of our personality. And the source of that fear could be anywhere amongst us.